Runtime: 3 hr. 15 min. The contemporary face of The Royal Ballet is shown in works from three of today's leading choreographers. 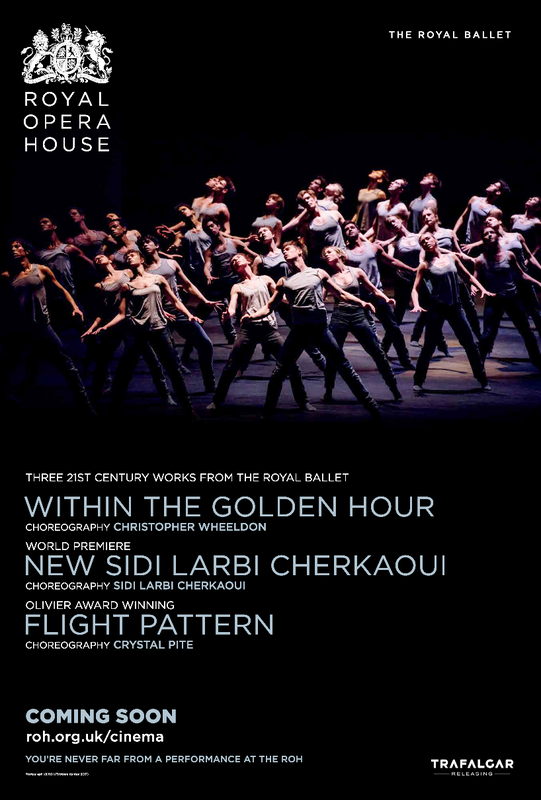 Wheeldon's Within the Golden Hour is based around seven couples separating and intermingling, to music by Vivaldi and Bossi and lit with rich colours suggested by sunset. Pite's Flight Pattern, revived for the first time, uses Górecki's familiar music and a large dance ensemble for a poignant and passionate reflection on migration. Between them, a new work created on The Royal Ballet by the acclaimed choreographer Sidi Larbi Cherkaoui has its premiere to bring the contemporary truly up-to-date.Premium event presentation, $15, $12 senior/child.